Joe Davidson writes the Federal Diary, a column about the federal workplace that celebrated its 80th birthday in November 2012. Davidson previously was an assistant city editor at The Washington Post and a Washington and foreign correspondent with The Wall Street Journal, where he covered federal agencies and political campaigns. Uncle Sam is recovering from nonessential surgery done with a dull, dirty blade. The partial government shutdown ended Thursday, but it opened a slow-healing wound that has corroded trust and confidence in the political process and Sam’s ability to stay on the job. It also seriously infected employee morale. 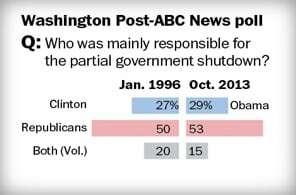 In a new Washington Post-ABC News poll, 82 percent of participants in a random public survey said the budget dispute leading to the shutdown damaged that workforce’s morale. Eighty-six percent said it damaged the nation’s image in the world. Are the House Republicans who led us into this morass happy now? At the same time, the shutdown demonstrated the strong desire and need for the many services government and its employees provide. It’s an unnecessary dichotomy, but perhaps it takes a shutdown to remind those who scoff at government and its workers of their importance. “I think one probably needs to distinguish between trust and faith in the political system and trust and faith in the federal employees and the day-to-day running of government. I would say those probably went in opposite directions” as a result of the shutdown, Office of Management and Budget Director Sylvia Mathews Burwell told the Federal Diary on Friday. Obama alluded to both the erosion of trust in government and the appreciation for federal employees generated by the shutdown in remarks delivered hours after the government reopened. Comments like that undermine morale and show a lack of understanding that should be surprising for someone with McConnell’s experience. All of this took a major toll on the morale of Ruthie Jefferson, a Federal Aviation Administration management and program assistant in College Park, Ga. The damage is particularly offensive because it stems from the actions of elected officials, who should set an example for public service. Instead, the Republicans, who are paying the price in stunningly low poll ratings — 77 percent of those surveyed said they don’t like the way Republicans handled budget talks — showed public servants how not to conduct themselves. “I have lost faith in the ability of our elected officials to accomplish their responsibilities as elected officials,” said Sharyn Phillips, an IRS estate attorney and National Treasury Employees Union chief steward in Manhattan. “ I am appalled that people who took the same oath of office as me to uphold and defend the Constitution were using the full faith and credit of our nation as a bargaining chip in their political game. Previous columns by Joe Davidson are available at wapo.st/JoeDavidson. The poll was conducted Oct. 17-20 among a random national sample of 1,002 adults, including interviews on land lines and with cellphone-only respondents. The overall margin of sampling error is plus or minus 3.5 percentage points.